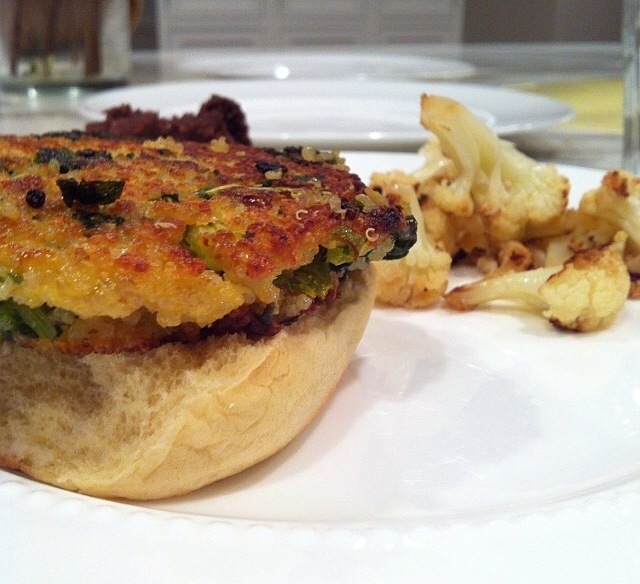 Tri Treat: Quinoa & Kale “Burgers”! YT Ambassador Brittany made these “burgers” for a healthy & yummy post workout snack! Thanks so much to YoungTri Ambassador Brittany for sharing this yummy recipe with us! She paired it with cauliflauer… yum! A great post-workout meal. Cheese and egg are optional! Combine quinoa, eggs, Parmesan, chives and salt in medium mixing bowl. Heat 2 Tbsp olive oil in skillet on medium heat then sweat onions and garlic, approximately 3 minutes. Add kale to skillet and cook until kale is bright green and soft. Add kale mixture to quinoa mixture, then add breadcrumbs and stir to combine. Place clean skillet on medium heat and add enough oil to coat bottom of pan. Form patties using ½ c of quinoa mixture and place patties in skillet being careful not to splash hot oil or overcrowd the pan. Fry until golden brown on each side, approximately 5 minutes per side. Remove patties, drain on paper towel and serve. Check out Cheryl Style for the original recipe and for an instructional cooking video! Thanks again for sharing, Brittany! Yum!